Australian James Kassay, perhaps best known here in the States for this video of him repeating Sleepy Rave (V15) in his native Grampians, is on a roadtrip in the U.S. with his first stop being Hueco Tanks, TX. He’s wasted little time getting things done with flashes of problems like Chablanke (v11), El Techo De Los Tres Bs (v11), Diaphanous Sea (v11/12) and Sunny Side Up (V12). Turning his attention to some more in-depth projecting Kassay made 2nd try ascents of Crown Of Aragorn (V13) and Terre De Sienne (v13)* in addition to a fast send of Alma Blanca (V12/13). With his time in Hueco running out Kassay is resting up for a go at two hard problems he’s “bloody close” on. The problems are Terre De Sienne’s sit start, Terremer (V15), as well as the unrepeated Desperanza (V15) which adds a lower start to Esperanza (V14). Kassay already did Esperanza this trip in what must have felt like a protracted multi-day battle compared to his other sends. Check out his blog for a nice rundown on his trip and a some excellent pictures of him on Crown Of Aragorn. 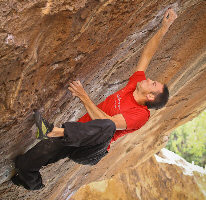 Also in Hueco is Australian Chris Webb Parsons who is on his 2nd trip to Hueco. His first trip in early 2009 ended somewhat disastrously when he badly injured his shoulder on Crown Of Aragorn. Reading his website one can learn that his first order of business this year was to exact revenge on Crown which he did successfully, and he also managed to send Alma Blanca and Terre De Sienne. Not Australian but still climbing hard in Hueco are Alex Puccio and Portia Menlove. Puccio recently did the likely FFA of El Techo giving her 20+ V10 or harder sends in the past year according to her 8a scorecard. Menlove repeated Sunshine (V11) which you can see video of here. *This is the 2nd time this season that someone has done Terre De Sienne in 2 tries! Yes, Fred Nicole … the real story.